Aviyal (அவியல்) is an important item in the feast menu and is made in Tamil Nadu, Karnataka and Kerala. According to mythology, aviyal was first prepared by Bheema, the Pandava prince. As it may be, aviyal is one preparation that would come to your rescue, if you do not have enough quantity of any one vegetable in your refrigerator! Aviyal and rasam satham make an excellent combination. * Cut ash gourd, plantain, carrot, potato, brinjal, French beans, cluster beans, snake gourd, yam, and drumstick into 1” long pieces. 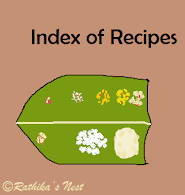 Cook taro/arbi (சேப்பன் கிழங்கு) separately. Though it is preferable to use all these vegetables for making aviyal, you can still proceed with the recipe, if you do not have one or two of the listed vegetables. Method: Add salt to the cut vegetables in a kadai and mix well. Place the tamarind ball in the middle of the vegetables. Cover and cook on a low flame. Remove the tamarind once the vegetables are cooked. Peel the pressure cooked arbi/taro and add to the vegetables. Mix well. Grind coconut, jeera, red chilli and green chillies into a fine paste. Once the vegetables are cooked well, add the ground paste, mix well and bring it to boil. Add curds, grated coconut and 1 tablespoon of coconut oil, and mix well. Switch off the fire. Heat the remaining coconut oil in a tadka pan (spice pan/தாளிக்கிற கரண்டி), add mustard seeds, when they start to sputter, add urad dhal, and fry till the dhal turns golden brown. Remove from fire. Add the seasonings and curry leaves to the aviyal. Serve hot with rice and rasam/ kuzhambu. Note: You may cook the cut vegetables in a pressure cooker. Place the cut vegetables in a container. Add salt and mix well. Place the tamarind ball in the middle. Pressure cook for 4 minutes or 4 whistles. Once the pressure subsides, remove the container and discard the tamarind. Proceed with the recipe.